"Based on groundbreaking research that has the power to change the lives of countless children--and the adults who love them." --Susan Cain, author of Quiet: The Power of Introverts. A book that offers hope and a pathway to success for parents, teachers, psychologists, and child development experts coping with difficult children. In Tom Boyce's extraordinary new book, he explores the "dandelion" child (hardy, resilient, healthy), able to survive and flourish under most circumstances, and the "orchid" child (sensitive, susceptible, fragile), who, given the right support, can thrive as much as, if not more than, other children. Boyce writes of his pathfinding research as a developmental pediatrician working with troubled children in child-development research for almost four decades, and explores his major discovery that reveals how genetic make-up and environment shape behavior. He writes that certain variant genes can increase a person's susceptibility to depression, anxiety, attention deficit hyperactivity disorder, and antisocial, sociopathic, or violent behaviors. But rather than seeing this "risk" gene as a liability, Boyce, through his daring research, has recast the way we think of human frailty, and has shown that while these "bad" genes can create problems, they can also, in the right setting and the right environment, result in producing children who not only do better than before but far exceed their peers. Orchid children, Boyce makes clear, are not failed dandelions; they are a different category of child, with special sensitivities and strengths, and need to be nurtured and taught in special ways. 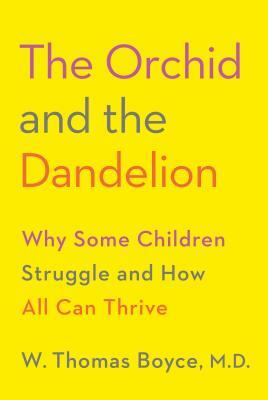 And in The Orchid and the Dandelion, Boyce shows us how to understand these children for their unique sensibilities, their considerable challenges, their remarkable gifts. W. THOMAS BOYCE, M.D., is the Lisa and John Pritzker Distinguished Professor of Developmental and Behavioral Health and chief of the Division of Developmental Medicine at the University of California, San Francisco. He is also codirector of the Child and Brain Development Program of the Canadian Institute for Advanced Research. He lives with his wife in San Francisco. "Seriously good ... I read it with pencil in hand, underlining ideas I wanted to hold onto, or even memorize. [Boyce] is also a wonderfully fine writer. His humanity and warmth inform his evidence-based insights, and his clear strong prose and poetic sensitivity make his stories compelling. The Orchid and the Dandelion leaves me with much to think about, and meaningful encouragement in my own personal life as a parent and grandparent."